Vibration is one of the biggest reasons the Crazyflie performance is degraded. Vibration effect the gyro and accelerometer measurements making them more noisy and inaccurate. Vibration is mainly caused by unbalanced propellers but can be caused by a bent motor axis as well. Balancing these small propellers is extremely hard and we are still searching for a good way to do it. An easier way to get balanced propellers are to sort them and categorize them according to their vibration. 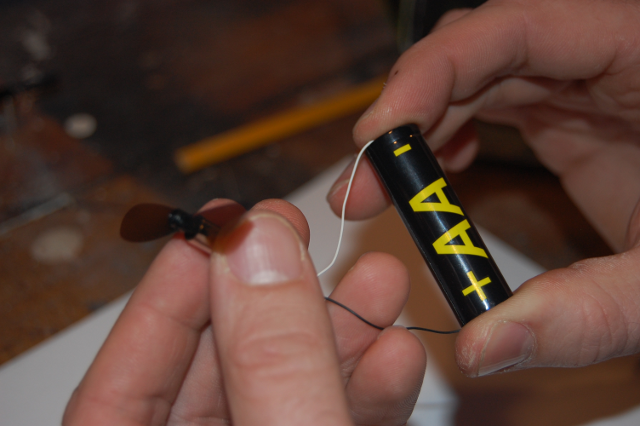 This can easily be done by using the spare motor and a normal 1.5V AA battery to power it while testing each propeller. After this has been done use the propellers with the least vibrations. There is also a tutorial on a balancing technique in the forum. Getting the centre of mass(CoM) in the centre of the Crazyflie will improve the performance as it means the motors will be equally powered when hovering on one spot. That will give maximum control head room for the stabilization and best efficiency. So when you attach the battery do your best to get the weight centered. This may be easier if you apply the double-sided tape to the PCB first, and then place the battery in the optimal location. Your copter is facing forward when both the red and green LED are doing so. However, that might be a bit difficult to determine, especially if you are looking at your copter from below (since it's flying higher than your head). To compensate for that you might want to mark the motor arm of M1 with some colored tape. The Crazyflie tries to hold its yaw orientation (rotation) steady based on feedback from its gyro. The orientation it's in when starting up is the one it will try to hold (unless changed via yaw inputs), so power it on in the orientation you want to fly it in. For beginners, that's almost always facing the same direction as you are, so that your pitch/roll joystick inputs line up with the physical direction the Crazyflie moves in. So, put it on the ground with the power switch in the front right corner and turn it on. If you notice your Crazyflie yawing (rotating) to a new heading when it takes off, you may wish to update to the most recent firmware. Newer firmware includes “crash detection” code that will reset the target yaw each time you take off from a full stop, in order to keep the Crazyflie from trying to spin to a new yaw immediately on takeoff. The Crazyflie can automatically level itself using the gyros, but it does not hold position automatically. You will need to compensate for its drifting with roll/pitch inputs. However, if it consistently drifts in one direction, you can have the client compensate by setting roll/pitch trim values. Try again and tune the trim settings until it drifts in all directions equally! You can set up buttons on your gamepad to adjust the trim as well, which is more convenient while flying. Just pay attention to the sign of the trims: if you set the RIGHT button to Roll+, you would use the RIGHT button to compensate for drifting LEFT.